Whatever happens in Moscow tonight, when England play Croatia in the semi-final of the World Cup, Gareth Southgate deserves significant credit as a communicator and leader. When Southgate was appointed to the job as England manager most football fans merely shrugged having, like me, given up on believing our national team could play well, let alone win anything, in our lifetime. We’d suffered too many near misses and failures from previous teams. We looked at Southgate’s club managerial record (led Middlesborough to relegation) and shrugged. Nearly two years later and Southgate’s reputation - previously defined by his penalty miss for England in Euro ’96 - has been transformed. So how has this been achieved? Anyone in a position of authority has a story that precedes them, defines them, elevates them above others and, sometimes, helps them beat their opponents. Shaping this story to your own benefit is hard. Southgate has embraced, rather than hid from, his previous failure as an England penalty taker. He has used this as an example of how he gets the team ready for games, demonstrating that he has learnt from England’s previous mistakes while gently communicating his coaching philosophy. In addition, as with many iconic leaders through history, he has recognised the benefit of dressing right to communicate his position as a leader and be instantly recognisable to millions. As with Churchill and his uniforms and cigar, Thatcher and her handbag, General Washington and his powdered wig, Southgate has donned a form-fitting waistcoat as part of his leadership story. 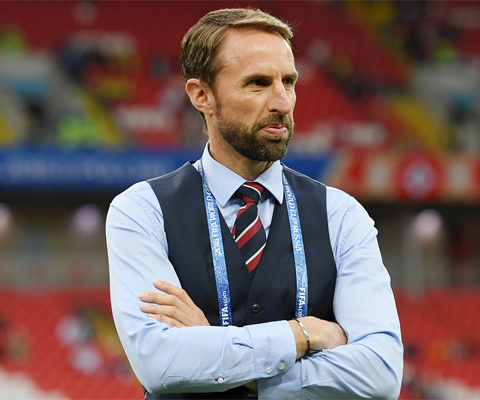 Today, to show support to him and the team, for alittle bit of good old sense of British fun, we have #WaistCoatWednesday when people are heading to work and school wearing a waistcoat as Southgate has taken to doing while stood on the touchline during this World Cup. The toxic relationship between England managers and the media is well known. The tabloid press particularly rarely give an England manager a chance to build a team or develop momentum. Perhaps the dire state of affairs when Southgate took over has helped, as with fans, expectations were low, but Southgate’s quiet authority has shone through. It is clear that Southgate respects others - a stark contrast to his woeful, arrogant, predecessor - and in return he too is given respect. Southgate is also good at a soundbite. He is also very aware of who his audience is. More intelligent than your average footballer he understands that sometimes the media just need a short, focussed answer that is quotable to make a story. Today’s news is a perfect example, full of great Southgate soundbites: “The players are ready”, “We can feel the energy and support from back home”, “Our country has been through some difficult moments recently in terms of its unity, but sport can unite”, “We have a great opportunity to reach a World Cup Final”. During a World Cup the media is a beast that has to be fed and the FA communications team have supported Southgate brilliantly with some well thought out stories and a willingness to work with, rather than against, the media. This support has helped communicate the togetherness in the squad as well as further tell the story of Southgate’s coaching philosophy. There is a real identity about this England team. It is positive. It is likeable. It is approachable. It is the embodiment of the manager who has put his stamp across everything the team does. It also has a philosophy in a way few England teams have done previously. Great sports coaches have a clearly defined philosophy which may be openly communicated or kept behind closed doors but, have no doubt, a philosophy exists. Southgate - a failure as a club manager - has had time working as England Under-21 boss and in other FA roles to develop his own philosophy and approach in a way that allows him to make best use of the players at his disposal. A great business quote is that “culture eats strategy for breakfast”. Without the right culture, success will be hard to come by. Listening to the legions of retired England footballers who talk of the chore of playing for England (surely the dream of most school boys and increasingly girls) and of the club rivalries that undermined previous teams Southgate’s efforts to build a ‘one team’ approach must be applauded. The Times reported this morning that Southgate is "absolutely adamant that his life will not change by this wonderful summer when he made a country dream”. While I hope his life does not change I also hope many others in this country will look at Southgate and be inspired to make changes in the way the lead their businesses, organisations and teams. In the context of the ongoing pressure Brexit is having on the whole of the United Kingdom, when leaders with humility, genuine concern for others and a willingness to find a plan that works then follow it through have been in desperate need, we should shine a light on Southgate’s approach. An inspiration for those in leadership positions and those with ambitions to lead whether in public life, business or sport. That is why Gareth Southgate is our Communicator of the Week.